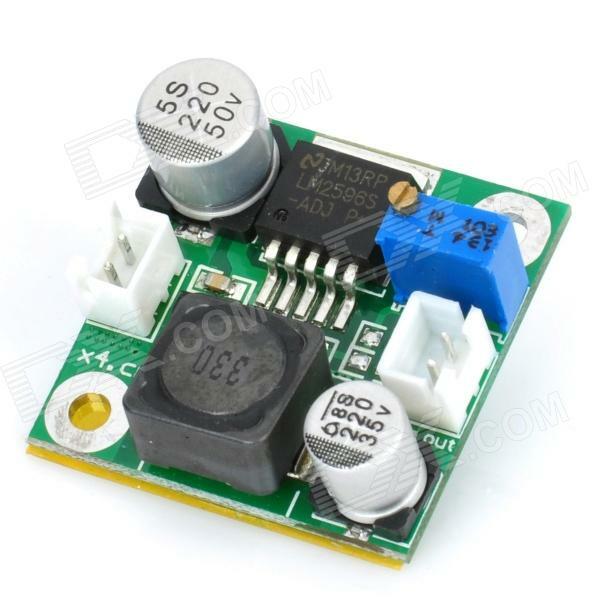 $4.2 solution that allow to use any ready market rig power solution with GH1 or Gh2. I used http://www.ebay.de/itm/LM2596-DC-DC-Step-Down-Adjustable-Converter-Power-Supply-Module-/180915297483 but those boards are all pretty much the same. I put it in the Cinematics battery pinch without HDMI splitter. There is a lot of space in the housing where the HDMI splitter would be. Added an additional conector to the housing, wired it up, adjusted the output voltage and since then its working fine with my GH2. I know very little about circuitry, but would it be possible to wire a fuse that blows if the voltage exceeds 10v, after the step down module? That way if anything goes wrong with the module, it still won't fry the camera body. Don't be fooled by its 'cheep as chips' price... $4 is a very expensive component- considering they make millions of these units. I believe that from reading the PDF the LM2596 features 'many' self protection circuits including an emergency shut down mode. Remember that these can get hot- so if you are going to be 'retrofitting' them to 14.8v V-locks or whatever- remember to try to keep them coolish, (heat sink from your local electrical shop). To answer @Sangye... I think that fuses work on Amps not Volts. So you could only protect the device if for example there is a short circuit and draws stupid amounts of Amps. Otherwise I think you may need some 'other' device in chain. @kankala. ($4 for the whole thing- not only the IC etc). The IC even has overheating protection! Ahh... Zenner - those are those things that create white smoke when you plug in the wrong power supply to a HDD? Save the drive but fry the diode- shunt to earth. Is this the kind that just gives off the extra energy in heat? Or is it one of the energy efficient models that actually converts? Is this the kind that just gives off the extra energy in heat? No, of course. They are quite efficient. Interesting... this could go nicely in a little plastic housing coming off the wire from a 12v battery. I wonder how the voltage is set? Are there dipswitches hidden out of view? Look at blue thing :-) It is adjustable. you mean that little screw? Yikes, there had BETTER be some dipswitches on the other side of that blue thing! You just need a voltmeter with which you will adjust it very precisely... it couldn't be done with DIP switches. Everyone tinkering with electronics must have a voltmeter, so this is very easy solution. I personally use a similar step-up module directly built in into the battery which goes into GH2 - so to the outgoing wire I can connect standard 7.4V Sony L battery. @kavadni : maybe worth to mention that I've used a 3rd party battery which I took apart.... so I can't comment on the insides of original coupler. And since I'm using a step-up converter that was a bit too long to fit into battery, I had to cut down the PCB partially and relocate the capacitor to side. hi guys, i have a sony f970 battery and it's 7.4v 8000mAh. do i need to use a step up/down module to connect the battery to my gh2 or can i just connect it directly? @alfi666 but gh2 original battery is only 7.2v. my concern is whether or not 8000mAh is too much for the gh2 to handle. it's not going to melt my gh2 right? my concern is whether or not 8000mAh is too much for the gh2 to handle. LOL. 8000mAh together with voltage defines battery capacity. While original battery can be less, external DC power must be more for GH2. @vitaliy_kiselev you are saying it doesn't matter what my batter capacity is as long as my voltage is in the right range it'll work? so that means i can have 10 of these batteries in parallel then attach a step up converter and i am good to go? step-up from a 7.2V battery grip to 9V for powering the GH2 and in a smaller form factor would be more useful.